Kindly follow the below steps to check your Aadhaar Authentication. Step 1 : Go to the official website of Department of Welfare of Scheduled Castes (SC) & Backward Classes (BC), Punjab through provided above. 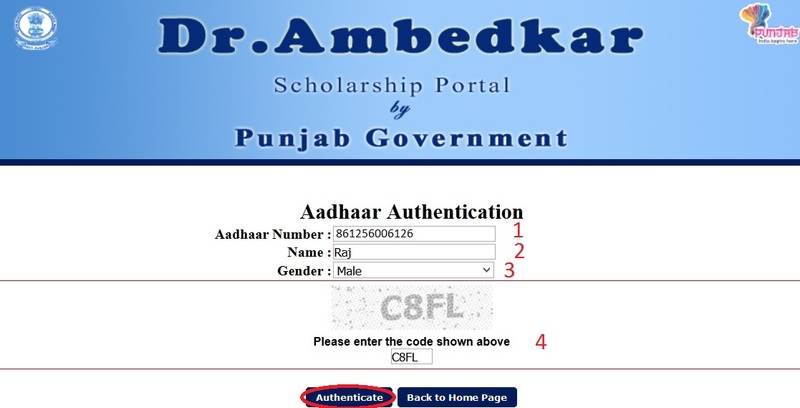 Step 2 : Then click on the “Check Aadhaar Authentication” link under Student Corner tab. Step 6 : Please enter the code as shown in the image. 1. What if I forget my Applicant ID/ Password? You can recover your Applicant ID/ Password by clicking on “Registered students: Recover your password” from the Registered Student Log-in box. You have to fill up details like First Name, Date of Birth, Mobile Number and e-mail Id, as you have entered in the application while generating the initial password. Application will regenerate the Password and SMS would be sent to your contact Mobile Number. 2. How to check the status of my application? You can check the status of your application anytime. After logging in, click on “ Edit-Lock-Print Application”. Then select “Track Status” option. This will provide you current / latest status of your Scholarship Application. 3. How can I apply for scholarship, if I am a student of Institute, located outside Punjab? You should send the application form manually to Director, Department of Welfare of SC and OBC, Punjab. 4. What to be done in case of User-Id/Password of the Institute is lost? Contact the Nodal Officer of your implementing department and ask him to reset the password for your institute. 5. What is to be done after submitting the online application? After locking and forwarding the application online to the institute, you should take a print out of the application (this would come with a barcode), sign it and submit it at the Institute with requisite documents as specified at Sr. No. 2. 6. Can I take print-out of my application at any stage? Printout of application can be taken with “Barcode”, after locking and forwarding the application which is to be submitted at the Institute. 7. How can I edit the entries, which are not editable at Institute level? If you have to edit certain entries like Institute Name, Course & Branch, annual Income etc. , which are not editable at Institute level, you should request the Scholarship Nodal Officer of your Institute to “temporarily Reject” your application, mentioning the mistakes detected by you. The Application will then be made available at Applicant level, by the software. You can then log-in using provided User-id & password and edit the required details. After editing, lock the application again so that it will be forwarded to the Institute.